The French tulip candle fragrance is delicate and understated. Its light, unique scent works well in many rooms. Tulips are a favorite flower because of their beauty. While many varieties of tulip give off just a hint of scent, a few types of the pretty perennial are more fragrant. These include: Apricot Beauty, Prince of Austria, Annie Schilder, General de Wet, Prinses Irene, and the French tulip. One of the largest of the tulip varieties, the French tulip's scent is still quite subtle. Light, refreshing, and airy, this scent of this France-originated flower also offers a touch of exotic whimsy, evoking the French countryside. The French tulip fragrance in candles, perfumes, room sprays, and oils is described as green and sweet. It is not a heavy or overpowering scent, but like the flower itself, soft and subtle. Additional ingredients may be added to create unique scents. Lemon, rose, clove and jasmine are other scents that you may find in conjunction with the tulip scent. With its soft and subtle smell, this fragrance is excellent for adding a relaxing and inviting touch to any room. This is one of the less-common candles, so you will only find select products embodying the scent. French Tulip Classic Toile Candle: A ten ounce hand-poured candle with 60 hours of burn time, packaged in a distinctive pagoda box display. 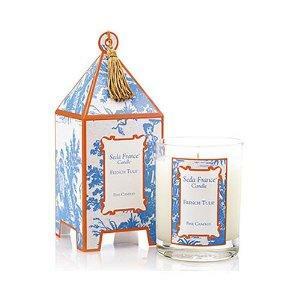 Mini French Tulip Classic Toile: A mini version of the original candle, available in a two ounce size. Three Wick French Tulip Candle: This large candle is 26 ounces and provides up to seventy hours of burn time. Oversize Classic Toile Candle: The French tulip scent comes alive in a massive four wick candle of 88 ounces. The large decorative box makes this an ideal gift item. Small Votives and Travel Tins: This scent is available in an affordable three-votive set and travel-tin candle for a smaller, more portable candle purchase. Other French tulip items from Seda France include a four candle collection gift set, body wash, hand soap, hand lotion, room mist, and oil diffuser set. Large Container Candle: A 30-ounce, lidded square candle with two wicks, this is the largest of the company's candles. Regular container Candle: A 15-ounce version of the large container candle. Round Candle: This round glass candle in a seven-ounce size is packaged in sleek lidded gift box, making it well-suited for gift-giving. Travel Candle: Take a field of French tulips on your travels, give as a small gift, or enliven a bathroom or other small room with the 3-ounce travel tin candle. Circle E Candles are long burning, highly fragrant, and hand poured. Among the company's scent selections is French tulip in a brick red color. You can purchase the candles 40-ounce, 28-ounce, and 12-ounce sizes for standard glass candles. Four-ounce votives are also available. For soy-based candle lovers, Hillhouse Naturals offers three white candle products in French tulip: a 17-ounce three-wick candle, a seven-ounce single wick candle, and a five-ounce tinned candle. A matching six-ounce diffuser set is also available from the company. The French tulip items are all part of Hillhouse Natural's signature collection. A French tulip candle fragrance can be used in many rooms. Sweet and light, you can place them in a variety of areas in the home to add a fresh touch. Bedrooms: The sweetness of the candle scent makes them a lovely addition to the bedroom, especially for every day use. For a more romantic atmosphere, combine with heavier floral or musk-scented candles. Bathrooms: Bathrooms just need a light candle scent to transport them into a refreshing sanctuary, and this one can do the trick nicely. Since most of the candles in this fragrance are available in white, the color can also blend well with bathroom décor. Guest Rooms: Since some guests may be sensitive too overly strong or powerful scents, French tulip is a good choice in a candle for a guest room. Living Areas: The hint of tulip in a living area can be inviting without overwhelming. Add this light fragrance to any space that needs an uplifting touch.